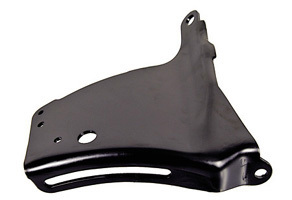 New replacement 1969 1970 1971 1972 1973 1974 1975 Camaro Small Block Chevrolet Upper Alternator Bracket for long style water pump. Use the drop down menu box for out of country shipment. Accurate heavy weight clean stamping. Technically correct accessory hole placements for listed applications. Use with all long neck water pump small block engines. Coated black. Officially Licensed GM Restoration Parts.